With edge so keen, welt deft and clean, one slash is like to kill. Yellow Ozyump. It was lifting Adam to his doom, but even in the terror of that moment the memory of its name flashed across his mind from out of hearthside tales. Savage beasts they were, descended from the bowlheads but now devoid of human wit—thirty to forty feet in height when standing upright on squat barrel legs, springy orange fur, bulging bellies, always hungry, driven wild by the smell of flesh, though they would graze on tundra grasses like cattle during the Thaw. 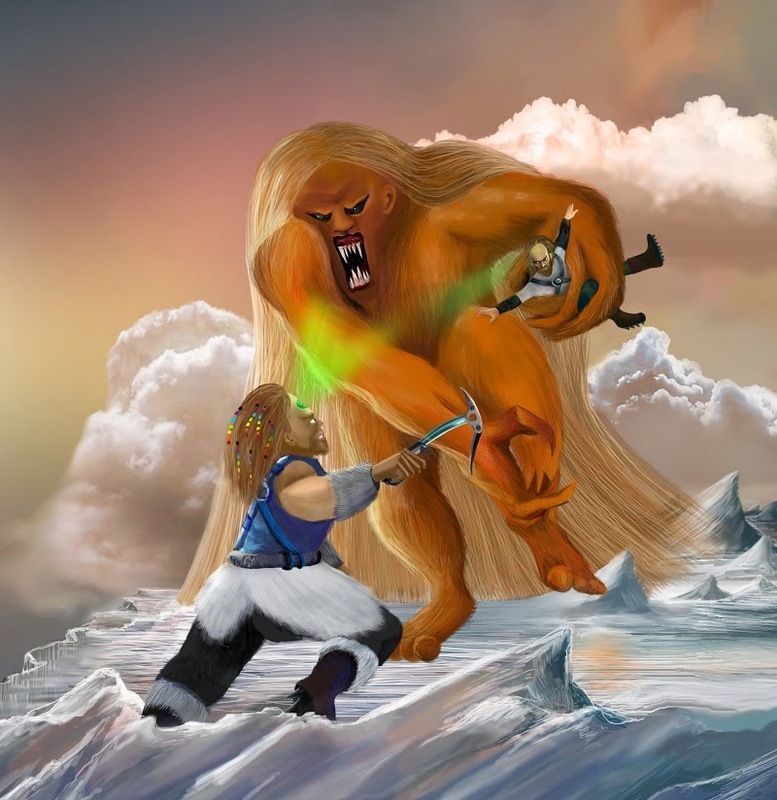 The most stunning sight was their mane of straight, streaming, straw-yellow hair that sprouted from the head and cascaded in broad thick waves all the way to the ground. When they sat they draped the hair about them as their cloak. When they slept it was their mattress and their blanket. The tales told that Ozyumps had hide so thick that no spear or knife could harm them. With spring-loaded arms near as long as the animal was tall, they struck like slingshots. No man could conquer them. The only safe recourse was to run, for these beasts were slow and lumbering afoot. Oh, does she? Ten quid says the thing’ll eat him ‘fore she says ‘Jack’. Ha! I’ll take that action. Who’s with me? She’s a caution, this Naja. Just you watch. Normal folk who couldn’t hear the Ancestor voices believed they were Gods, worthy of unquestioned honor and devotion. Adam knew better. There were billions of Ancestor Spirits, with personalities every bit as diverse as their formerly living counterparts. In times of urgency or desperation the most vocal among them tried to out-shout one another with their particular counsel or opinion—it was like an out-of-control political debate in a public square. The wise and the subtle rarely prevailed. She has it planned. Three centuries in the making. Mark my words. Three centuries planning a meal for an Ozyump. Harrrr! Look at it drool. He’s a goner, that one, and I’ll have my ten, I thank ye. Apostate. They were punishing him. That was the truth of it. Adam’s left arm was pinned by his side by the hairy orange fingers. With his right arm he was fending off the Ozyump’s putrid drool. But the motion toward its mouth had stalled. The creature seemed confused by the tether dangling from Adam’s waist, stretching tight and still connecting him to the heavy sled at the entry to the tunnel. And Sam still had his grip on the back of it. All that weight was more than the creature could lift. He may be well-and-truly doomed, but apostate Scavenger Adam BrownEarth would not give his taunting spectators satisfaction. “Hold on, Sam.” he shouted, his voice strained and thin from the pressure on his lungs. “Whatever you do don’t let go. It can’t lift the weight.” Sam might not even know what’s happening. He was barely visible, still hidden by the creature’s shadow in the darkness of the tunnel. No, Sam knew. The Ozyump squalled and tugged harder. Adam’s sled began to topple. Five hundred pounds of ice chips came spilling out, lightening the load and surely pummeling Sam with sharp-edged shrapnel. With a jerk, he began rising toward the mouth again as a new round of howls and guffaws came from the watching Spirits. Let go, Perfid Sam LordBishop, Keeper of the Faith. Run and save yourself, say I. Says ten quid, and harooo! Well met, apostate, and farewell to thee. Can you be an apostate if you’re right? Adam had never openly revealed his feelings, having only recently earned a community voice when he came of age. And even if he spoke his mind, his opinions would be dismissed. Those with the most life-experience commanded the greatest respect: that was the core lesson of mankind’s Long Sojourn into Harmony and Balance. In Adam’s species respect for one’s Elders extended seamlessly beyond mortality. Now, it appeared, Adam’s unspoken, un-acted-upon heresies were being laid bare for judgment by the immortals. Must the wise child follow a foolish Elder to his doom? Humans were rapidly going extinct on this planet, being displaced by the likes of Ozyumps and Irula. Men blindly worshiped the Ancestor Spirits of their dying breed, held the most ancient of them to be the Creators. But were the Creators infallible? Apostate. Even Adam’s sister believed in them. Lissa seemed to know the Gods intimately. She said he should trust the Spirits despite their contentiousness, their head-splitting harangue and babble. Well, he could not bring himself to trust the ancient Voices, but he did trust Lissa, lowest of the low. Where he had no faith in the high and mighty, he had implicit faith in his palsied waif of a sister, paralyzed over her entire right side, unable to walk, barely able to speak. Was he wrong? Infused throughout scripture and religious practice was the oft-repeated phrase: The downtrodden shall be elevated above kings. 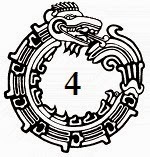 It was this verse that mandated Chicxulub’s Nuncio to seek his First Mother here in the Forsaken Marches where the most downtrodden of all humans had always dwelt. The meek shall inherit the Earth. Somehow, when Adam was near his sister, she was able to throttle the Gods themselves. It was like magic. She would lift one of her Matryoshka Dolls and a special ‘Spirit-look’ would come into her eyes. Then, inevitably the voices stilled, and Adam had blessed relief. Once in a while, from out of that calm a single voice would come forth, as if Lissa had selected it. It was seldom the same Ancestor who spoke, and the messages were cryptic, but sometimes the Spirit spoke to a future event; or offered a remedy for a vexing problem. Rejoice, O Ice-born—ye King of Armies. This is no end for you; make it your shining hour. Sam, throw him your knife. These ‘readings’, as the Keeper called them, had earned Adam a reputation from a very early age. Yet even that was a curse. His Cronies’ incessant, often petit demands for readings were as much torture to Adam as the Spirit Voices. Sometimes when he was very young the Marchioness would command Adam to the Citadel—to the sprawling greenhouse overlooking the river, built by Luke himself. The Bench of Mages sat scowling at him as the Lady commanded him to testify about petit crimes of the village. It felt as if he was the one on trial. They would keep him away from his family for as long as an Order, allowing only Lissa, trapped in a cage-like crib with her dolls, and Sam there with the best toys and trinkets in Saskatoone. Sam LordBishop would be a future Keeper, but his own grandparents were exploiting him like a pawn in a power game. Adam caught it, adjusted his grip, and met the Ozyump’s wrist with all the force he could muster. He hadn’t even noticed, but there were creases of pale skin there at the base of the enormous hairless palm, within easy reach. And bulging through them he saw huge blue veins. Sam was right. But no human had ever killed an Ozyump. How could he possibly know?